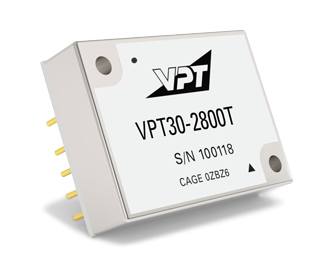 VPT30-2800T DC-DC Converter | VPT, Inc. This triple output 30W DC-DC converter is uniquely designed to power electronics in military vehicles, ships, weapons, and other rugged systems. Three independent, isolated outputs are included at up to 15W each for powering multiple loads from one small module. Additionally, built-in compliances reduce your component count and cost in power systems, for example, where space is at a premium yet military standards are imperative. The triple outputs plus the included compliances make this space-saving module very cost-effective for demanding applications. Electrical Performance at Tcase = -55° C to +100° C, Vin=+28V ±5%, full load, unless otherwise specified. (2) Derate linearly to 0 at 110° C.